L.A. Pride starts this Friday with a stellar lineup of performances, programs, and festivities lasting through Sunday, June 8. Whether you’re headed to West Hollywood for the celebrations or just passing through, you’ll want to be aware of street closures and bus detours in the neighborhood this weekend. Metro Bus 10, 30/330 and Rapid 705 will detour at San Vicente between Melrose and Santa Monica from approximately 8 p.m. this Thursday until early Monday morning. For further information, see our service advisories page. Metro Bus 2, 4, 10, 30, 105, 217, 218 and Rapid 704 will detour at multiple locations on Sunday for the Christopher Street West Parade. Again, our service advisories page has all the details. For a list of street and facility closures–including West Hollywood Park and Library–click here. To avoid traffic and parking congestion during the celebration, use the free Pride Ride shuttle. The shuttle will run every 15 minutes and follow a continuous loop along Santa Monica Boulevard between Robertson Boulevard and Fuller Avenue. Shuttles will be brightly marked and feature festive music. There will be a few breaks in service however, so be sure to check the Pride Ride map (see above) for hours of operation. While at L.A. 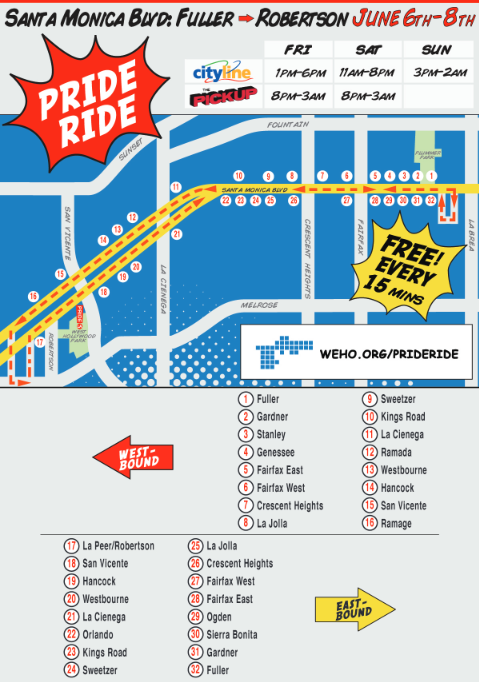 Pride, look for the Metro booth for free transpo goodies, and have a safe and fun pride celebration! Lily, the Metro website doesn’t appear to have any information on service changes in West Hollywood. Do you have a direct link you can provide to information? The information should be posted later today or early tomorrow. The detour info is out, but it sometimes takes time for the site changes to go live. Thanks for your patience and we will update the link as soon as the specific page is up. You can also follow Metro on Twitter to get updates on detours @metrolosangeles or @metroLAalerts. Thanks! Just wanted to let you know that as of now, the specifics of the LA Pride detours this weekend have been posted on our Service Advisories page. Click on the two Service Advisory links in the post and you’ll be able to see the detours for the Pride Festival (all weekend) as well as the Pride Parade (Sunday only). Thanks for your patience. From when until when does the Pride Ride Shuttle run?